Yesterday afternoon I had the opportunity to meet with Kaela Speicher, a highly talented photographer based in Pittsburgh, PA with a passion in her styled fashion photography. Her personal work shows her many skills ranging from envisioning a shoot stylistically to the final retouching in post-production. I met with Kaela to finalize working as an intern with her my final quarter at The Art Institute of Pittsburgh, going over schedules, itinerary, and goals for this exciting opportunity. When I first saw Kaela's work, I was very interested in her editing style; her retouching is so clean and hides the many hours of post-production in its natural appearance. Looking at her work, you can see the eye she has not only for each shot itself, but for the vision, styling, and location scouting that comes along with each shoot. Even though there is so much work before, during, and hours of editing after shooting for the final image, she enjoys what she does, and it shows. See Kaela's fashion work on her website: www.kaelaspeicher.com. Over the next several months, I will be sharing updates about the Internship process with a look at what I'm learning, behind the scenes, and current projects. With the knowledge that Kaela has in a photography career, I have many goals for this time in working with her. 1. Retouching. Phlearn is an amazing site that has taught me everything I know about retouching and post-production, but I know I can always improve my skills and learn different methods. With the endless possibilities in Photoshop, there are countless ways to approach editing. My goal is to learn to new ways to retouch for a natural and an "unedited" look. Along with this, getting an effective workflow down would benefit my working process. 2. Reviewing technical skills and marketing strategies. Reviewing the basics are never a bad idea, and sometimes you can learn something that you missed the first round. I want to work my way up in reviewing from the basics of photography to business and marketing strategies, as well as building SEO. Some additional steps I would like to cover are what types of jobs are ideal for my personal style in work. 3. Transitioning from the label "student" to "professional". It's the curse of a photo student. People tend to look down on students and not consider them professional until they have degrees. As we are told by our professors, we are to look at our work and ourselves as professionals, as this is the only way we can be viewed as one. However, the actual transition to the real world from student life is harsh and sudden. It's a huge reality check and will make or break you. Upon graduation, I hope to push myself to use my learned skills in a career setting and keep working to find the job for my work. 4. Keeping organized and scheduling shoots in a successful way. It's easy to become bombarded when dealing with multiple sides of a business by yourself and coordinating shoots between a model, makeup artist, hair stylist, and personal schedules. It's a necessity that I learn how to keep this balanced and keeping some sanity along the way. 5. Developing my final portfolio in my style. I feel that often it's difficult to shoot specifically for a personal portfolio. When you are shooting for other people and their visions, it's easy to push your personal work aside. As I am graduating at the end of the Internship, I would like to gear everything I produce to my final portfolio that reveals my personal style. Kaela also introduced the idea for the end of my Internship to shoot a project, and have her as my assistant in the shooting process. This would serve as a final project to showcase my improved skills over the three month period and shot specifically as a personal projects. 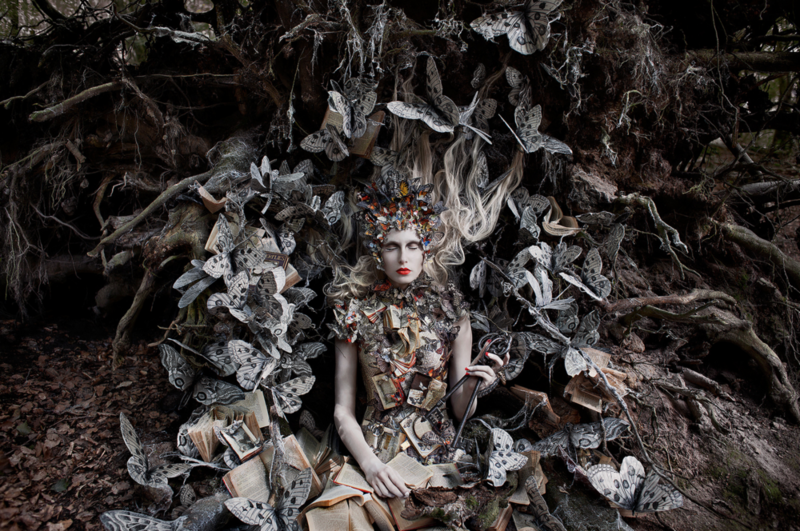 Highly inspired by the work of Brooke Shaden, a fine art photographer, and Kirsty Mitchell, a fine art and fashion photographer well known for her Wonderland series, I want to develop a conceptual shoot with the intricate details to produce a surreal and styled environment and look. This will also push me to work with other artists for styling and allow me to use composite and retouching techniques as well. Next week I'll be sharing more about my Internship with Kaela as it officially begins in the new and my final quarter at The Art Institute. Thanks for reading!